Unsubscribe from Nat Geo WILD? Dr. Pol travels across rural Michigan to care for every family pet and head of livestock in need of his expertise and kindness...and no health insurance required! Treating numerous patients, including horses, pigs, cows, sheep, alpacas, goats, cats and dogs, Dr. Jan Pol comes to the rescue with his hands-on, old-school, no-nonsense approach to veterinary medicine. A local legend making farm calls, he serves his patients with incomparable compassion, humor and energy, treating all animals no matter their size or condition. 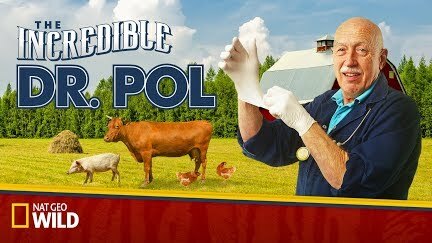 ➡ THE INCREDIBLE DR. POL AIRS SATURDAYS 9/8c.